Purchasing and owning a home is a huge benefit, but many people forget some of the costs associated with it. Homeowners insurance is one cost that doesn't go away and can affect your budget in a big way. In some cases, your annual premiums could increase over time. While the cost of homeowners insurance may rise due to inflation, increased building costs, or other factors, it's important to remember that you can find ways to keep this cost minimized. Here are ten ways to lower your homeowners insurance premium. Your deductible is the amount of risk you agree to accept before the insurance company starts paying on a claim. With the cost of homeowners insurance escalating, it no longer makes sense to let the insurance company assume all the risk. If you have a low deductible of $50 to $100, consider raising it to at least $500 to $1,000. You could save up to 25% on your premiums. Some companies are offering deductibles equal to 1% of the insured value of your home ($1,000 deductible on a $100,000 home). It that seems like a lot of money to pay in the event of a claim, consider this: the trends in homeowner's insurance are for insurance companies to severely penalize customers who file one or more small claims. Often the premiums are raised significantly or the policy is cancelled. When the customer looks elsewhere for coverage, they may find it costs them three times what they were paying. Consider buying your homeowners and auto insurance policies from a company that offers both and bundling them together. Some companies offer discounts ranging from 5% to 15% if you buy both types of coverage from them. Check around and make sure the price is lower than buying the two policies from two different companies before making this move. Some home insurance companies offer discounts to homeowners for good behavior. If yours an incentive program, make sure you're receiving all the discounts for which you're eligible. For example, discounts exist for smoke detectors, deadbolt locks, security or fire alarm systems, fire extinguishers in the home, etc. If you're over 55 and retired, you may qualify for an additional 10% discount. It makes no sense to buy insurance to protect yourself against risks you are unlikely to encounter; for example, earthquake coverage in a non-earthquake zone, or a jewelry floater to your policy if you don't own expensive jewelry. At the same time, however, don't skimp on coverage that's essential, such as wind, fire or flood insurance. Risk plays a big part in determining your insurance costs. The riskier a person or property is to insure, the higher the price tag for insurance climbs. Ask your insurance agent what you can do to make your home less expensive to insure. Making changes that reduce the risk of damage in windstorms and other natural disasters is one example. Another is updating old wiring or heating systems, which may reduce your risk of fires therefore reducing your premiums. Your home is your biggest investment. 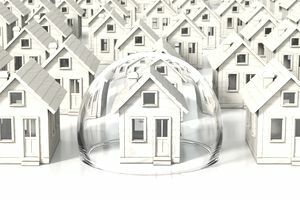 Make sure it's adequately protected from risks you cannot afford to cover yourself and that it covers any home improvements you've made, major purchases, and increased costs of rebuilding. Also check to see what supplemental coverage you may need. This is especially important if you live in an area that experiences severe weather situations, such as tornadoes, hurricanes, earthquakes, wildfires or floods. Once a year, before your homeowners insurance policy is due to renew, dig out the current policy, read through all the details, and call your insurance agent to discuss any changes in your situation that occurred during the year. Make sure you're addressing any new insurance needs and removing any coverage that's no longer necessary. Insurers are shying away from some risks. For instance, owning certain types of dogs (Rottweilers, Doberman Pinschers, Pit Bulls), can limit or void your policy. Owning a swimming pool or a trampoline can increase your cost of coverage. Read all the fine print in your policy under the "Conditions and Coverages" sections so you know all the things that are excluded from coverage. You may opt to buy additional coverage to protect yourself from certain exposures. Depending on where you live, your credit score could have an impact on the rates you pay for homeowners insurance. If you want to get your credit in shape, stick to practicing good credit habits. Don't have too many open credit accounts, don't charge close to the limits on your credit cards, and pay all your bills on time to keep your credit score healthy. Shop around for homeowners insurance rates but keep in mind that you may be receiving a longevity discount if you've been with your current insurer for several years. Typical discounts are 5% if you've been with the company for three to five years, and 10% for six years or more. Get quotes from three agents, and take any longevity discounts with your current insurer into consideration when you compare prices. Your state insurance department may have rate comparison information available for your state. By keeping these best practices in mind, you may be able to put yourself in a position where you're immediately saving more cash with a reduced homeowners insurance policy. If you know your options, you'll have more leverage in finding ways to lower your premium. After doing your research, be sure to speak with a knowledgeable agent who can advise you and help you apply any savings you realize. Can I Delete Additional Structures From My Home Policy to Save Money? Did You Just Have a Claim? You May Not Have to Pay Your Deductible.